Are these healthcare headlines giving you a headache? 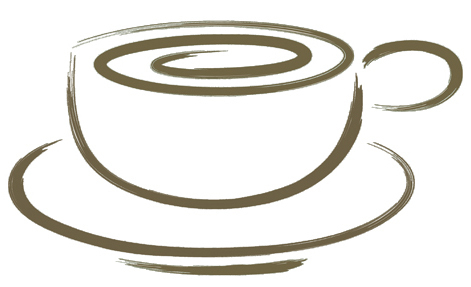 Check out the Action Alert from Indivisible National and our Healthcare Morning Coffee Action to do our part to end the healthcare debacle. 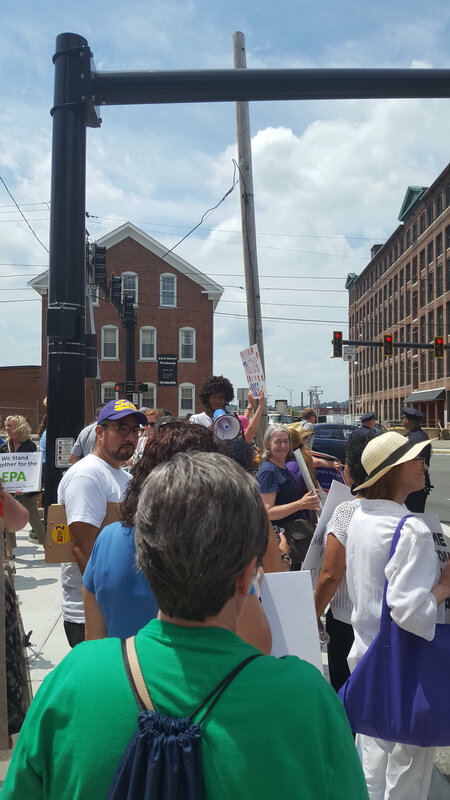 On July 20, members of Minuteman Indivisible joined a peaceful, energized crowd in Lawrence to oppose Paul Ryan's support for dismantling the ACA. Speaker Ryan was in town to visit the New Balance factory to promote his new tax reform plan. 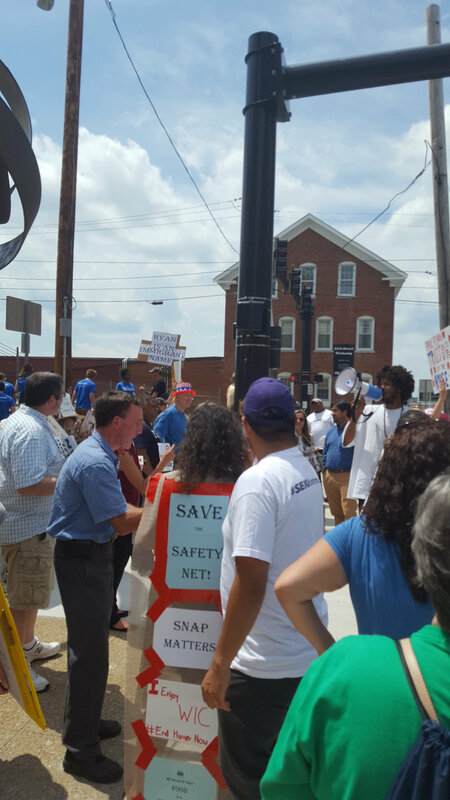 The rally was organized by United Healthcare Workers. For more information, see SpareChange and watch this video that includes some of our committed members! 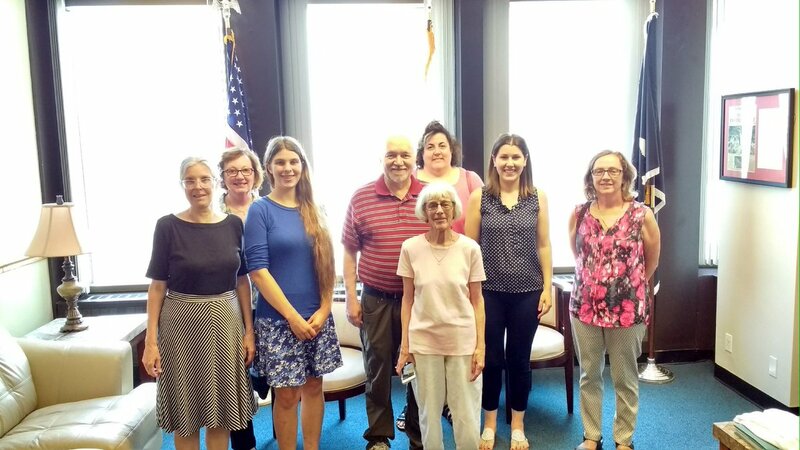 Minuteman Indivisible participated in the Indivisible National Day of Action to stop TrumpCare on July 18th. Our visit to our Senators' offices was one of 170 events in nearly 40 states and DC. Check out some video highlights from the day that Rachel Maddow shared last week. Our Senate office visit and presence at the Paul Ryan Rally were featured in a Public News Service article. Read No Time to Rest to see us quoted on the topic of healthcare. 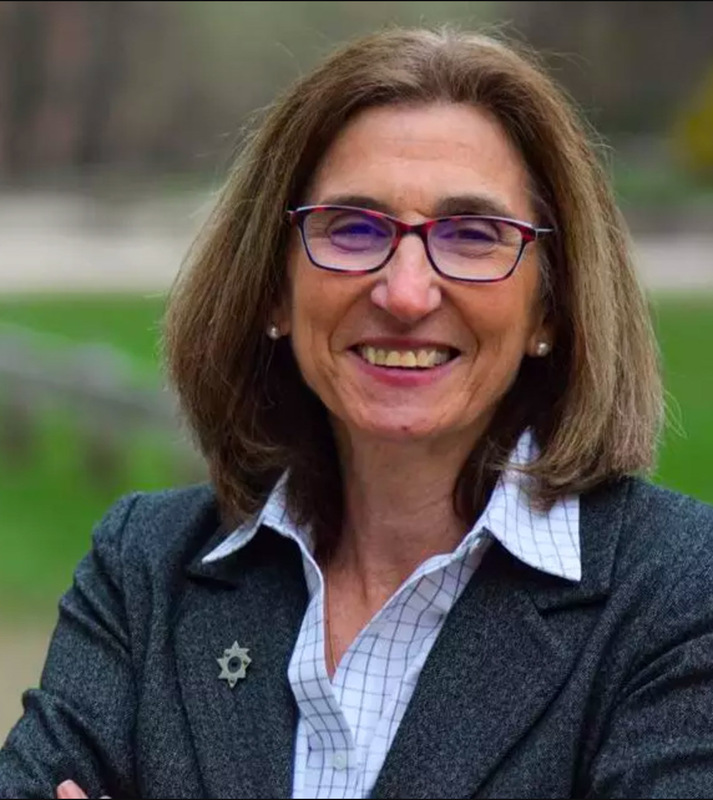 Cindy Friedman captured the state senate seat for the 4th Middlesex last night in the special election. We wish her the very best in the senate and look forward to working with her to develop effective legislation. The members of the executive committee are continuing to discuss a new board structure and by-laws. With more defined roles, it will be easier to communicate to all our members and have meaningful, effective actions. The exec committee is also working on facilitating more communication between teams and amongst members. If you are interested or know of someone you think might like to join the MI board please email us at info@minutemanindivisible.org. The Progressive Democrats of Massachusetts (PDM) are holding a joint meeting between their education working group and people who signed up to work on education issues during Rep. Kaufman’s Democracy Demands Engagement workshops to discuss the possibility of working together on education issues. If you’re interested in these issues, we encourage you to attend this meeting. Don't wait until you witness a harmful situation to ask yourself "what should I do?". Come to Active Bystanders’ Training and learn to recognize when you are a bystander, to analyze the situation and evaluate the consequences for everyone involved, and to take responsible action to help people in need instead of remaining passive. This course is appropriate for anyone 12 years old or older so you can even prepare your kids for tricky situations. This is a 2 hour training and will cost $15 / person (which is shared between the Lexington Human Rights Committee and Quabbin Mediation). Click here to register. Join us as we discuss On Tyranny by Timothy Snyder. There’s no need to have read the book in advance. We’ll provide a brief summary to get the discussion started and focus on how it applies to our Minuteman Indivisible activities. Click here if you hope to join us or have a book that you would like to suggest as a candidate for a future meeting. Learn to recognize when you are a bystander and to take responsible action to help people in need instead of remaining passive. Come join the discussion of On Tyranny by Timothy Snyder. Click here if you hope to join us or have a book that you would like to suggest as a candidate for a future meeting. Join us as we discuss where to go next with Healthcare advocacy. New members welcome! At our July meeting we began discussing where to devote our efforts for the next four to six months, including which Congressional races to support. We hope to finalize our decisions at this meeting and welcome your suggestions on which projects you think we should undertake. If you would like to volunteer for a district race or for a specific campaign action please fill out our Elections Form. Keep HubDialing to Stop the Senate Health Care Plan! We lost a procedural vote that puts Senate Majority Leader Mitch McConnell that much closer to the finish line. But he still has a huge lift on his hands: convince 50 Senators to vote for a complete dumpster fire of a bill—a bill that will cause 15 to 32 million people to lose their insurance, according to the nonpartisan Congressional Budget Office, and a bill that at least 58 Senators are on record as opposing in some previous iteration. Usually a vote for the Motion to Proceed (MTP) signals support for the underlying bill. But senators literally do not know which bill they’re taking a final vote on—which means the outcome is anyone’s guess. The vote on final passage will be Thursday or Friday, so we need you RIGHT NOW. We need your help making calls to voters in NV and WV. Use the Indivisible Hubdialer - it's easy! Speak with voters in other states and urge them to reach out to their MoC to share their stories and ask for a NO vote on the repeal and replace bill. HubDialer makes the calls and scripts are provided. Indivisible is paying for the cost of the calls. To register for the HubDialer, go to Indivisible Hubdialer and follow the on-screen instructions. For more information see the Indivisible guide on Trumpcare. If you haven't seen this video, we suggest that you spend 15 minutes watching it. Call the Senate Judiciary committee (202-224-5225) and demand that Jeff Sessions come back and explain the inconsistencies in his prior testimony. Call the Senate Intelligence Committee (202-224-1700) and the House Intelligence committee (202-225-4121) and demand that Kushner, Manafort and Trump Jr testify publically, under oath. Congress created the Save Vanishing Species Semipostal Stamp—commonly referred to as the "Tiger Stamp"—which lets consumers support these wildlife conservation programs every time they send a letter. Since the Tiger Stamp went on sale in 2011, more than 35 million have been sold, raising over $3.7 million for international conservation at no cost to US taxpayers. This great program will expire later this year unless Congress acts to renew it. Ask your Members of Congress to cosponsor S.480, the Multinational Species Semipostal Stamp Reauthorization Act. Help Indivisible Guide meet their fundraising goal this week to launch a new digital accountability initiative and reach 65,000 new people to hold Senate Republicans accountable for their vote on TrumpCare. Read this fascinating article "There's a political earthquake happening here" which discusses the California 4th district and Regina Bateson. Warren and Markey: Thank them for opposing the AHCA/BRCA and ask them to cosponsor the Multinational Species Semipostal Stamp Reauthorization Act. Representative Clark (617.354.0292): Thank her for her involvement in a bipartisan effort to improve online safety: the new bill aiming to outlaw online behavior that's considered abusive. The Online Safety Modernization Act, H.R.3067, is a great bipartisan effort to curb online harassment, which disproportionately affects women, LGBTW folks and people of color. Senate Judiciary committee (202-224-5225): The American public deserves to know if the Trump campaign colluded with the Russians. I demand that Jeff Sessions come back and explain the inconsistencies in his prior testimony. Senate Intelligence Committee (202-224-1700) and the House Intelligence committee(202-225-4121) The American public deserves to know the truth about whether the Trump campaign colluded with the Russians. I demand that Kushner, Manafort and Trump Jr testify publically, under oath. Governor Baker (617.725.4005): Thank him for publicly showing opposition to the GOP healthcare bill and then express your displeasure that his budget proposal (H3829) would make Massachusetts the first state to roll back the ACA's Medicaid expansion. Finally, urge Governor Baker to keep pressure on the Russia investigation - we want the truth. For more information see Baker trying to have it both ways.